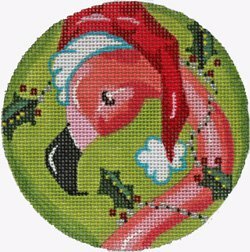 A handpainted needlepoint Christmas Ornament called Flamingo in Santa Hat by KAMALA. It is offered by Julie Mar and Friends designs. The design area measures 4" in diameter and is handpainted onto 18 mesh mono canvas. If you require stretcher bars we recommend TWO pair of 8" stretcher bars and some thumb tacks.